The so-called indicative votes on Monday night were not legally binding, so the government would not have been forced to adopt the proposals. But they had been billed as the moment when Parliament might finally compromise. Motion C: Committing the government to negotiating "a permanent and comprehensive UK-wide customs union with the EU" as part of any Brexit deal. Motion D: Referred to as Common Market 2.0, this option would mean joining the European Free Trade Association and European Economic Area. Motion E: Calling for a confirmatory referendum, giving the public a vote to approve any Brexit deal passed by Parliament before it can be implemented. Motion G: Aiming to prevent the UK leaving without a deal, including a vote on whether to revoke Article 50 - stopping Brexit altogether - if the EU does not agree to an extension. 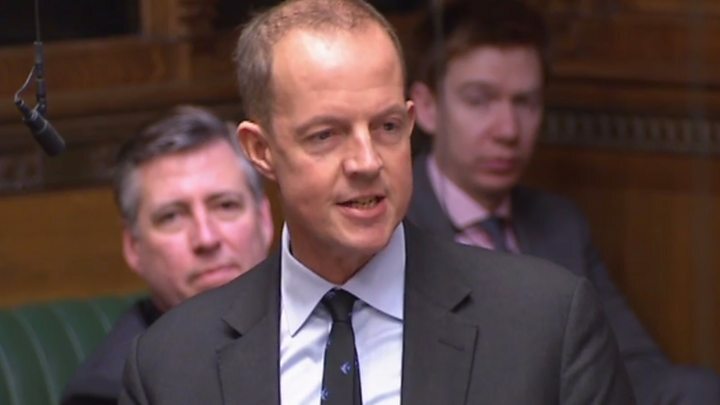 Following the failure of his own motion, Common Market 2.0, Conservative former minister Nick Boles resigned from the party. The MP for Grantham and Stamford said he could "no longer sit for this party", adding: "I have done everything I can to find a compromise." As he left the Commons, MPs were heard shouting, "don't go Nick", while some MPs from other parties applauded him. He later tweeted that he would remain an MP and sit in the Commons as "an Independent Progressive Conservative". Brexit Secretary Stephen Barclay said the "only option" left now was to find a way forward that allows the UK to leave the EU with a deal - and the only deal available was the prime minister's. If that could be done this week, he added, the UK could avoid having to take part in elections to the European Parliament in May. Health Secretary Matt Hancock agreed it was time for Mrs May's deal to be passed. But Labour leader Jeremy Corbyn said that while it was "disappointing" that none of the proposals secured a majority, he said he wanted to remind the Commons that Mrs May's deal had been "overwhelmingly rejected". He urged MPs to hold a third round of indicative votes on Wednesday in the hope that a majority could yet be found for a way forward. Hear more from Laura and the gang in Brexitcast. Liberal Democrat Norman Lamb told BBC Look East he was "ashamed to be a member of this Parliament" and hit out at MPs in his own party - five of whom voted against a customs union and four of whom voted against Common Market 2.0. He said the Commons was "playing with fire and will unleash dark forces unless we learn to compromise". But prominent Brexiteer Steve Baker said he was "glad the House of Commons has concluded nothing". He said the prime minister must now go back to the EU and persuade them to rewrite the withdrawal deal - something they have so far refused to do - otherwise the choice was between no deal or no Brexit. Senior figures in the EU, though, showed their frustration at the latest moves in Westminster. European Parliament Brexit coordinator Guy Verhofstadt tweeted that by voting down all the options, a "hard Brexit becomes nearly inevitable". BBC Europe editor Kayta Adler said the mood in Brussels was one of disbelief - that the UK still does not seem to know what it wants. She said EU leaders were also questioning the logic of arguing over things like a customs union or Common Market option at this stage, because right now, the UK has only three options as they see it - no deal, no Brexit or Theresa May's deal - and anything else is a matter for future talks once the UK has actually left.